Urban high life singer, Adekunle Gold has officially announced the release date of his highly anticipated About 30 album. The cover art of the album has also been made available to the public. The singer has carried us along, through his journey to releasing his sophomore album since it commenced. 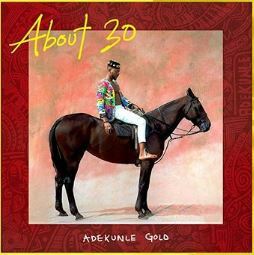 In 2016, Adekunle Gold released his debut album titled Gold which turned out to be one of the best music albums in the country, at the time. Not too long ago, he released the puzzling track list of the About 30 album and promised to announce the release date on a much later. The date has now come and ‘Dekunle posted on his Instagram page that the About 30 album would be available to us on May 25th, 2018.